Temporarily boost attack, but gradually lose HP. A pyromancer fears the flame. However, this fear subsides once it is accepted as a substitute for strength. Increases the attack by 20% and stamina regeneration by +30, but drains HP gradually. Looking to your left and slightly behind you you should see one of the bookcases on the left wall slide down. Go into the room it revealed to get the pyromancy from the corpse and the Witch's Locks whip from the chest to your left. It may be wise to dunk your head in wax, to prevent any accidental cursing from the curse hands. 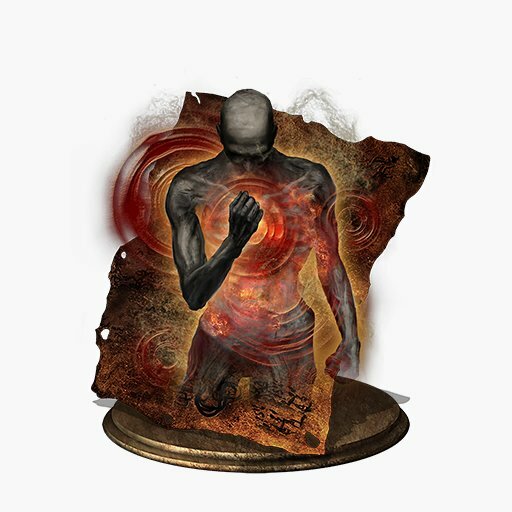 The rate of health loss is 16hp every half second with a +10 Pyromancy Flame, however damage numbers may be different depending on Pyromancy Flame upgrade level. With a +10 Flame, the damage boost is 20%, however this may change depending on upgrade level.